An overview of Chambers Bay Golf Links in University Place, February 26, 2014. A California hotel developer is formulating plans to build a 220-room hotel and a second 18-hole golf course at Chambers Bay in University Place. Pierce County has entered into a preliminary agreement with Sonnenblick Development, giving the firm until mid-June to develop its project and financing plans. If a formal deal is reached after that, construction would not start until after the U.S. Open at Chambers Bay golf course in June 2015. It’s the third attempt to get a project off the ground at the county-owned property and the first attempt since 2010, when another developer failed to secure financing. A resort hotel was part of the 2010 plan as well. But building a second golf course is a new addition. Besides the hotel, Los Angeles developer Bob Sonnenblick said he wants to build another 18-hole golf course where, unlike the Chambers Bay course, golfers could ride carts. Chambers Bay prohibits carts to prevent damage to fescue grass on the links-style course. Sonnenblick said adding a second golf course is crucial to attracting more golfers to the hotel he would build. “There’s a whole resort golfer community who won’t play this course right now … because they don’t walk 18 holes,” Sonnenblick said in an interview with The News Tribune. Sonnenblick said the third part of the project is a retail and restaurant pavilion near the waterfront, potentially with kayaking and sailing. But it won’t be included in the initial design. His firm has hired Robert Trent Jones Jr.’s company to design the second golf course. Jones designed the original Chambers Bay course. An architect is planning a three- to four-story hotel — with conference and banquet space and a golf clubhouse — that would sit at the top of the property overlooking Chambers Bay. Sonnenblick, who is chairman of Sonnenblick Development, estimated the entire project would cost about $120 million. A championship golf course, about 7,000 yards in length, would take up 180 acres. The hotel would sit on another 15 acres. Deputy County Executive Kevin Phelps said the county hasn’t calculated how many of the 930 acres at Chambers Creek Properties could still be developed. 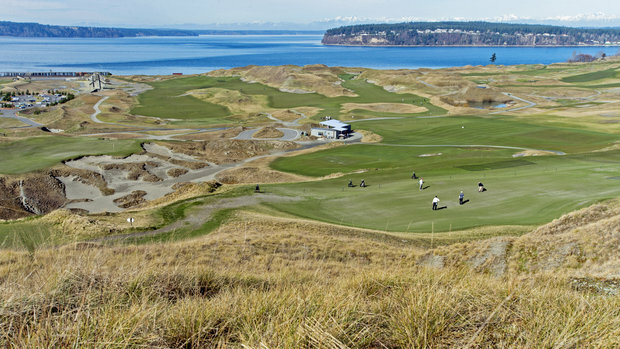 The Chambers Bay course takes up 300 acres. Other areas such as setbacks, buffers and land to expand the Chambers Creek Regional Wastewater Treatment Plant are off limits to development. Sonnenblick said there’s “plenty of room” for the entire project. He and the county would have to reach an agreement on plans for the project and a lease before construction could start. “We put up 100 percent of the money,” Sonnenblick said. Either party can back out of the first step — a one-year, pre-development memo of understanding — without any cost to the county. “We lose nothing by seeing what they have to put on the table,” County Executive Pat McCarthy told County Council members this week. The county can’t negotiate with other developers for Chambers Bay while the agreement is in place. Phelps said another party likely would enter into the same type of agreement if Sonnenblick and the county decide to part ways. Council Chairman Dan Roach said the council first learned of the agreement from McCarthy on Feb. 19, after she had signed it on Feb. 14. Roach said he’s hopeful development at Chambers Bay will occur, providing tourism and sales tax dollars to help pay for the county-owned golf course. The course made money last year, said county spokesman Hunter George. It lost money in the four previous years, requiring an interfund loan to make debt payments. Both the County Council and University Place City Council would have to approve changes to the master plan for Chambers Creek Properties, which doesn’t include a second golf course, said University Place City Attorney Steve Victor. Victor said the project — which would require permits from the city — would be a “great amenity” for University Place. Sonnenblick said he expects to acquire financing. Sonnenblick said his company acquires bank financing and does business with a dozen state pension funds that become equity partners for projects. Phelps said Sonnenblick’s company has a “tremendous track record” of developing major projects in Los Angeles and elsewhere. Sonnenblick said his firm is developing its first golf course — with a 335-room Westin Hotel — adjacent to Pinehurst Resort in North Carolina, where this year’s U.S. Open will be played in June on Pinehurst No. 2. It also was an investor in a golf course in Boca Raton, Fla. He said his company is developing six hotels over the next two years totalling $500 million, about half of which are financed. Golf aside, Sonnenblick said he expects the Chambers Bay location overlooking Puget Sound will be a big draw.